Our Will : An renewable energy is an exploitable energy by the Man, in such a way that its reserves do not become exhausted. Our will is to enable you to benefit durably from these renewable energies thanks to our range of photovoltaic, wind solar panels or heat pumps in particular. SOLUTIONS ENERGIES provides you solutions innovating at a cost controlled for all the stations of consumption in energy of your hearth or your professional site. Our Method : We select for you the best components of the market in order to integrate them in our systems of production of clean energy. For the private individuals or the professionals, the urban areas or the sites isolated, you will find in our product range the solution corresponding to your energy needs. 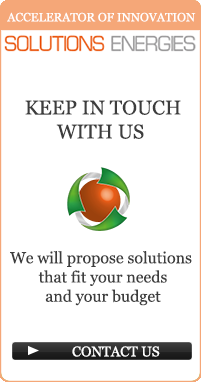 Our team is there to advise you and direct you towards the solution in energy most appropriate to your profile. We associate a local service with a step of constant quality on all our products. Origin : SOLUTIONS ENERGIES was born with the feeling to have a role to play in the development of clean energies and with the will to innovate in this field. We ara installed in Vedène close to Avignon in Vaucluse, France. Our experiment in the field as of renewable energies was forged while working and by installing systems of production of clean energy in the whole world.